We haven’t done a running blog on the three-day circus this week that was the Brett Kavanaugh confirmation hearing in front of the Senate Judiciary Committee – because as everyone knew, there wasn’t going to be an enormous amount of substance to be found there. Not that Kavanaugh offers no substance, mind you. Kavanaugh is one of the most substantial Supreme Court nominees ever offered for confirmation. He’s written over 300 opinions as a judge on the DC Circuit, and more than 70 of them were upheld by the Supreme Court in cases the Supremes granted certiorari to. That’s a record almost nobody has ever matched – and particularly nobody as young as Kavanaugh is. The question of his fitness as a judge was already answered when he was nearly unanimously confirmed to his current position, by many of the same Democrats now acting as though he’d be the end of the world as a Supreme Court Justice. It’s not Kavanaugh who’s been the problem this week. It’s been the extreme idiocy of the Democrat Party, which has colluded with various leftist outfits to wreck the hearings and turn them into a clownshow complete with lunatics in handmaid costumes, sign-bearing Code Pink morons, and screaming adult children interrupting the proceedings. All of these people were able to infiltrate the hearing room thanks to invitations from the Democrats on the committee, and they’ve surely behaved no better. In particular, a pair of Democrats purporting to be 2020 presidential candidates – Kamala Harris and Cory Booker, neither of whom possess so much as a percentage of Kavanaugh’s patience, temperament or intellect – have done what they could to drag the nominee and his confirmation hearing through the muck of the DC swamp this week. That either one could believe their actions would position them as presidential candidates of a major party is either an embarrassing delusion or an even more embarrassing exposition of where America is as a country. 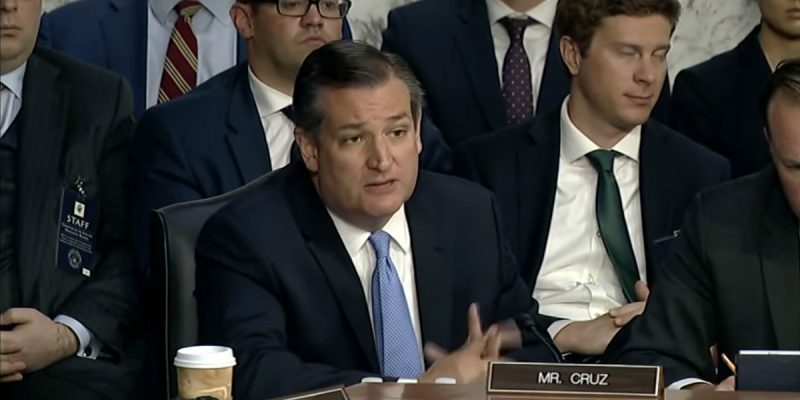 But on the first day of this spectacle, Sen. Ted Cruz of Texas put the Democrats in their places with this, the only speech of the hearing really necessary to understand what was really going on this week.